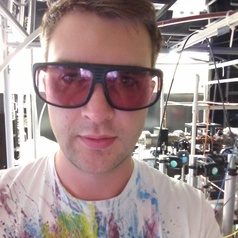 PhD student at Australian National University - Centre for Quantum Computation and Communication Technology. Work includes experimental and theoretical work on storing and interacting quantum states of light using cold clouds of atoms. While I am interested in exploring and developing quantum technologies, I am also interested in the unanswered fundamental questions and the underlying nature of reality that gives rise to such spooky physics. Aside from my studies, I am a keen musician, playing in a couple of community bands.